This ambitious stealth horror adventure is destined for the bargain basement. Frustrating, buggy and overly dependent on trial-and-error, this is a missed opportunity. What is it? Cartoon stealth horror game set in a strange suburban neighborhood. Hello Neighbor makes for a great elevator pitch. You play as a suburban kid in a Pixar-inspired technicolour neighborhood where something sinister lurks beneath the bright colours and exaggerated lines. During the game's opening you witness your middle-aged neighbor behaving strangely, shouting and boarding up the door to his basement. Your task is to invade his house and discover his secret, using stealth and trickery to evade a single, ostensibly reactive, opponent. It's an ambitious idea with a lot of promise: Alien: Isolation by way of The 'Burbs and Home Alone, a kid-friendly stealth horror sandbox. Unfortunately, Hello Neighbor doesn't deliver: after months of alpha versions, the launch version of the game is buggy, inconsistent, and frustrating. The initial charm of the art style and premise quickly gives way to trial-and-error drudgery, and the atmosphere that Hello Neighbor tries to cultivate is quickly punctured as the game's mechanical issues are starkly exposed. There's no real distinction to be made between the neighbor's dynamism and his inconsistency. He has no routine that you can plan around or try to disrupt. Hello Neighbor doesn't clearly communicate what he can see, what he will be disturbed by, or what will trigger a search. I've had him run past me unfazed because I've got one ankle concealed in an inch of shadow and I've had him launch at me like a heat-seeking missile from 20 yards away when I was sure he was looking in the other direction. Getting reset back to the start of the level is a more effective way of shedding the neighbor's attention than trying to engage with Hello Neighbor as a stealth game. There is a sort of reactivity at work, in that he'll lay traps near doors you frequently use and place cameras to block certain pathways, but these are easily cleared. Given that there's no real consequence for being caught—you're simply reset back to the start of the area—this feature doesn't add much beyond additional busiwork. It certainly doesn't create the sense that this strange, leaping, grunting, tomato-throwing man-thing is an intelligent opponent. Each level has a fixed solution, with limited room for meaningful decision making. Once you've figured out the correct sequence of blocks to stack, doors to unblock, tools to find, power switches to flip and pipes to tinker with, Hello Neighbor devolves into a series of trial-and-error solution attempts. The neighbor exists to frustrate those attempts, but getting caught isn't a big deal: you keep any pickups that you've found and the level state remains much as you left it. In fact, it's often better to get caught rather than get drawn into an escape attempt. 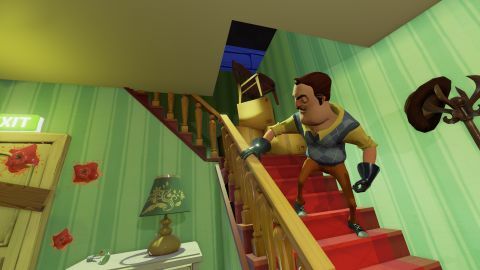 Getting reset back to the start of the level is a more effective way of shedding the neighbor's attention than trying to engage with Hello Neighbor as a stealth game—which is a clear sign that this isn't really a stealth game at all. Instead, Hello Neighbor is best thought of as a puzzle game where you're frequently set back to the start of a section with very little you can meaningfully do about it. Puzzle solving also suffers for floaty movement, inconsistent physics, and bugs—such as key items vanishing—that can completely derail your progress. Some of the puzzle solutions, particularly in the second act, are inventive, but the frustrating, stop-start way in which you work towards them robs the game of its charm. Even on a stable PC that comfortably exceeds the recommended settings, Hello Neighbor suffers from inconsistent FPS, freezing, and crashes. A limited number of in-game settings allow you to change resolution, texture quality, anti-aliasing, draw distance and other image quality options, but there's no way to alter the FOV. Controls cannot be rebound beyond changing mouse sensitivity and inverting the Y-axis. As Hello Neighbor progresses it becomes distinctly stranger, and the solutions to its puzzles move further and further away from the core premise. The house grows into a teetering, unlikely labyrinth full of egregious leaps of logic—think full-on Gabriel Knight 3 cat moustache territory. I had exactly zero fun attempting to crack Hello Neighbor's later stages on my own, and it feels inevitable that you'll be pushed towards YouTube tutorials to figure out the frequently bizarre logic. In fact, Hello Neighbor seems far better suited to Let's Plays than actual play. It's a game whose bizarre logic benefits from quick-cut skip-to-the-solution editing, whose half-functional AI neighbor can be funny when it's not your playthrough that he's disrupting. In that the game functions as a vehicle for people to entertain one another, it has some potential as a pass-the-controller puzzle experience for players with a very high tolerance for repetition. That doesn't excuse the many areas where it doesn't function at all, however—those bugs, glitchy animations and crashes that crop up too frequently to be ignored. Hello Neighbor's chief redeeming feature is its art, which is striking, and the often inventive setpieces that it constructs around its central mystery. There is genuine imagination and a sense of style at work, here, it's just a huge shame that it's bolted to such a frustrating, inconsistent game. There's such huge potential in this idea, and sometimes when you're creeping through the neighbor's kitchen listening for the sounds of him moving about in another room you get a sense for the atmospheric home-invasion adventure this could have been. But then something goes wrong—you repeatedly collide with a low frame while trying to mantle through an open window, your hands clip through the floor while cowering under the bed, the object you're holding pings off at an odd angle never to be seen again—and the illusion breaks completely. Once it's gone you can never quite get it back, and when you realise that getting caught doesn't matter that atmosphere of fear will never really return. A sufficiently enthused YouTuber might be able to summon it back for the benefit of their audience, but for the regular player Hello Neighbor doesn't earn that kind of investment.